This month marks the anniversary of one of the most tragic events of the twentieth century, the sinking of the British passenger steamer RMS Lusitania on May 7, 1915, by a German U-boat off the coast of Ireland. She had left New York on May 1 bound for Liverpool, ignoring German warnings that the seas around the United Kingdom had been declared a zone of unrestricted submarine warfare. Although international law prohibited the firing on a non-military ship without warning, the Lusitania was carrying war munitions, which the Germans claimed made her a legitimate target. A single torpedo hit the Lusitania on the starboard side, causing a secondary explosion within the hull. It sank in eighteen minutes, killing 1,191 people, including 128 Americans. The international outcry against Germany’s attack was keenly felt in the United States, still a neutral country in 1915, and moved public opinion closer towards supporting the Allied nations against Germany. In 1917, when Germany once again launched a campaign of unrestricted submarine warfare to try and starve England into defeat, the United States declared war on Germany. 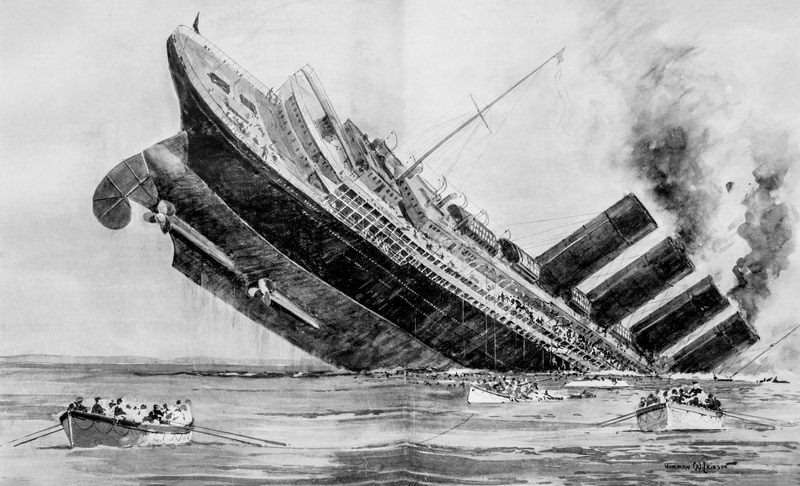 Much controversy still surrounds the sinking of the Lusitania. A succession of British governments since World War I have always denied that munitions were being transported, but in a recent declassification of documents it was shown that in 1982 the British government warned salvage divers of the presence of explosives on board. A number of British documents regarding the Lusitania remain classified. You can learn more about this story in Lusitania: Triumph, Tragedy, and the End of the Edwardian Age by Greg King and Penny Wilson read by Johnny Heller.